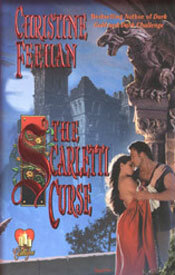 This is a review of the audiobook of The Scarletti Curse, by Christine Feehan, which I checked out of the library and listened to while recovering from eye surgery back in 2013. A classic Gothic tale, though written in third person omniscient point of view rather than the traditional first person. All the Gothic conventions are here: the young, innocent heroine, the older, domineering and mysterious hero, the forbidding house, in this case an Italian palazzo, the dark atmosphere and sense of impending doom. Nicoletta is a young peasant woman with a special gift for healing. She is sweet-natured and free-spirited, used to running barefoot over the hills of her homeland, but at the same time dedicated to her healing arts. When she and her guardian, Maria Pia, are called to attend the Scarletti family at the Palazzo Della Morte (Palace of Death), as the peasants call it, she meets the dark and brooding Don Giovanni Scarletti. He and his little niece Sophie are ill from tainted soup. Was it poisoned? If so, who was the target? When the don decides to claim her, Nicoletta resists, even attempting to run away, but the don will have his bride. She goes reluctantly to the palazzo, a dark frightening place with a reputation for destroying women. A number of them have been murdered, from Giovanni’s grandmother to several maids, including Nicoletta’s own mother. The palazzo is full of secrets and dangers and Giovanni fears he cannot protect her. But who is safe in the Palazzo Della Morte? The danger and tension build to a dramatic climax that includes the requisite confession by the villain. Gothic fans will love the atmosphere and the satisfying romance. Rebecca Cook’s narration is delightful. She does the Italian accent well and gives each character a unique voice. The only criticism I have, other than some occasional overheated prose, is that I didn’t get a good sense of time and place. I could not tell you what part of Italy the story takes place in nor which century. The audio cover didn’t help as the clothing pictured looked quite modern. The original paperback cover gives more of a Renaissance look, which I think is close to the period. It was clearly pre-Industrial Revolution, but that was as close as I could pin down. But I imagine most readers will not care, as the story is very enjoyable. Leave a comment to be entered in my monthly drawing for a $15.00 Starbucks gift card!